The Project Setting our sights on better web presence. 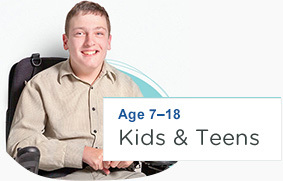 Scope is one of the largest providers of disability support in Victoria. 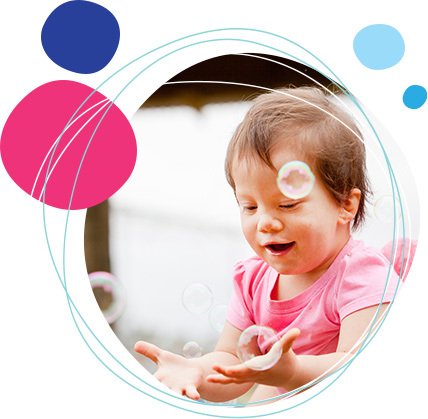 It is also one of the largest not-for-profit organisations in Australia. With a reputation for excellence and a dedication to high quality service, Scope wanted to improve their website to better reflect these traits online. Internally, the organisation had recognised that it was the right time to refresh their brand. 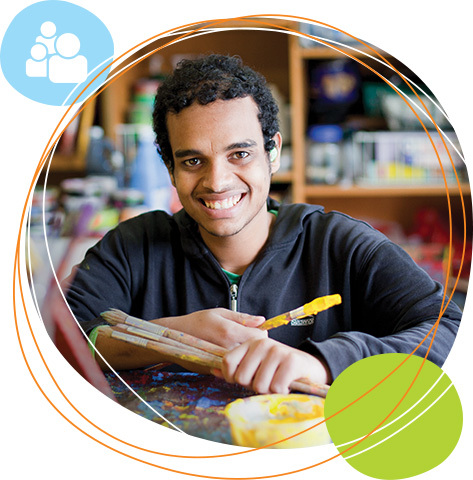 At the same time, changes to funding under the National Disability Scheme (NDIS) had come into effect. The situation was clear. Scope simply had to move forward and make things better. Accessibility was a key concern. The brief required that all information on site is easy to find, simple to scan, and useful – particularly on the services and landing pages. So the challenge was set: build a clean, clear and convenient digital experience for people hoping to access disability services, or information on Scope and the services they provide. Let's go. Defining the audience Meet your users, then meet their needs. Persona analysis always plays a major role in any project. It makes for a strong, strategic foundation by establishing who'll be using a website, when and why. In Scope's case, the research phase uncovered that information will be most powerful for these audiences when It's segmented according to each group's particular needs. Put plainly, a broad-stroke approach just wouldn't work. 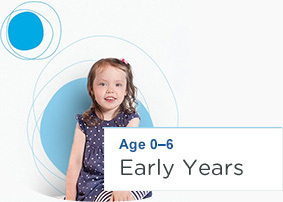 The site has to tailor content so that it's immediately applicable to the unique audiences: early years, kids and teens, adults and seniors. This approach helps users find the relevant information faster, stops them from sifting through unnecessary content, and ensures that Scope can speak directly to its audiences in the most appropriate tone. With the user audience segmented into categories, it was time to design a solution that caters to each of their requirements. The solution? 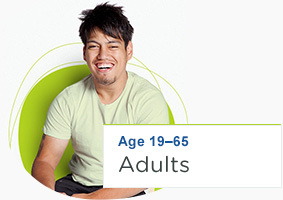 As soon as you land on the Scope homepage, you can immediately select the age group you belong to, and you'll receive tailored information from that point on. That way, you don't have to spend time needlessly sifting through material that doesn't apply to you. It's all collated by age group, and it's all easy to find. Elsewhere, the overall look and feel of the site is designed to meet Scope's brand-new branding requirements. You'll notice that the 'stone pathway' – representing the steps in a person's life journey – is carried throughout the site to deliver a seamless and holistic brand experience. Everything's designed to be welcoming, with a real, human approach. The photography uses real Scope participants too, to ensure that the spirit of the program is accurately reflected throughout the site. Key content and important information – such as contact details or calls to action – are highlighted and easy to find. This approach adds a splash of colour, but helps to ensure that everything is anchored in functionality: colour makes buttons and content easier to action, so that users can easily achieve their goals. Accessibility and WCAG Beautiful, accessible design aesthetics. Some agencies may shy away from WCAG, but we're all about embracing accessibility. The Scope website is Level AAA in most parts, and Level AA where AAA was not possible. We rigorously tested countless aspects of the site to meet the guidelines, including font size and usage. We also used contrast checkers to meet guideline 1.4.3 Contrast (Minimum). Testing Testing + key considerations. When it came time to test and improve the Scope site prior to launch, we made sure we were thorough. We owe it to the users, to create the best experience possible. That's why, over three days, we consulted and collaborated with a key cross-section of Scope customers, supporters and staff. Throughout the workshop, we discussed opportunities to make some slight tweaks and improvements to ensure the site is ideally suited to its user audience. After testing, we took some steps to minimise confusion for locating pages. 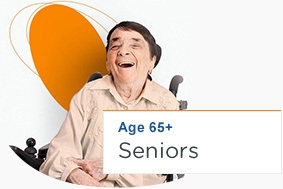 For example, the location page is a sub-page of the About Us section – rather than Contact Us – and the links to it in the icon panel were not replicated in the main navigation. 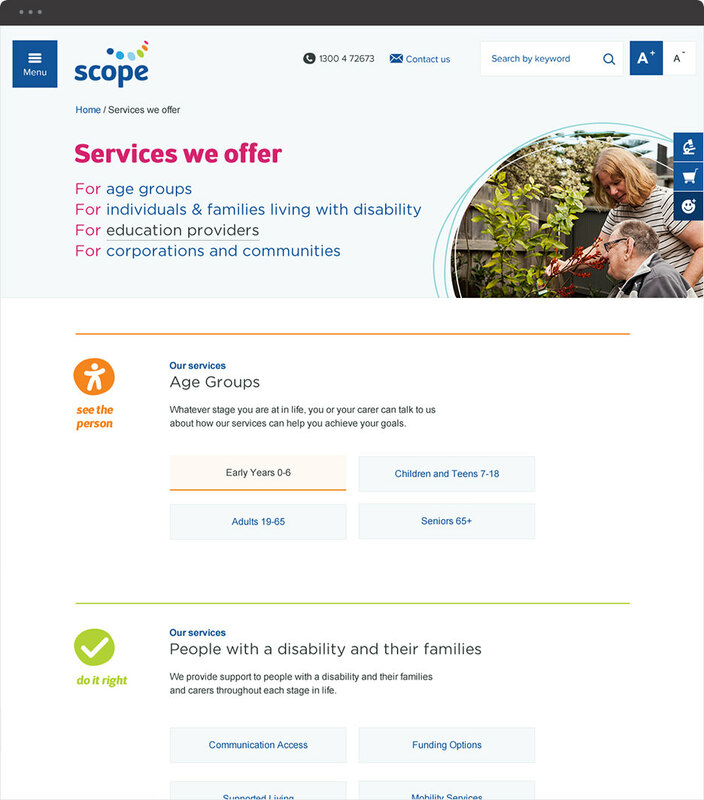 The Scope site uses various techniques to create a better experience for potential users with dexterity issues. All pages on the site can be made smaller or larger, using the A+ and A- buttons that hover on the top right corner of the site. The resizing corresponds to the guideline 1.4.4 Resize text, for Level AA compliance. We also ensured that all buttons are large enough to minimise mouse precision when trying to click them. While not specific to WCAG, we consider it a best practice consideration because it provides for a better experience. We improved some key areas of the site to ensure that people using screen readers have the best experience possible. A screen reader will audibly tell the user when a field is mandatory, rather than just reading out an asterisk. We modified the HTML on the site to enable a screen reader to recognise mandatory fields. The changes also mean that a screen reader can provide a description of the captcha field, with instructions on how to fill it in. Another feature we implemented for screen readers is consistent terminology. For example, all versions of 'contact' were changed to 'contact us' to maintain the common use of this term. On the homepage, we improved the 'Read more' links for screen reader users too. When a user hovers over these links, the reader says the name of the section they are choosing to read more about. 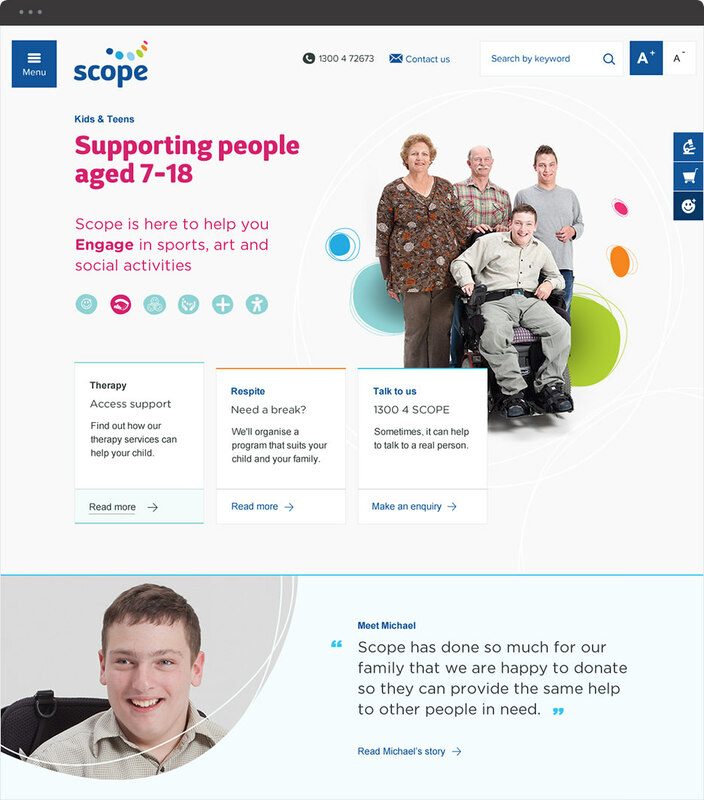 Thanks to a collaborative approach and some thorough research, we were able to deliver a website that is ideally suited to the needs and abilities of Scope's wide range of audiences. It's a project we're particularly proud of. Now that people can better access the services and information they need, they can get essential support faster, and with greater ease.